Last week, my post was about the conspiracy to make parenting even harder. The onslaught of “helpful” information. The recalled baby products. And the pressure to interact with our children in a way that promotes their cognitive development. (Blah, blah, blah). I’ve had a bit more time to think things over. And now I’m wondering if maybe we– the parents– are really at the root of the problem. Maybe WE are the ones making this job even harder than it needs to be. To be honest, I’ve had this suspicion for a while. It has been festering in me since I had a conversation with my mother-in-law a few years ago. Jacob was around two years old at the time. And a handful. My mother-in-law is a glass-is-at-least-half-full kind of person. And (not-for-nothin’) JACOB’S GRANDMOTHER. So, naturally, she saw his antics, constant motion and early ‘negotiation’ skills as just delightful. Here is a woman who raised three children. THREE. Seemingly without breaking a sweat. (Have I mentioned that she is always up on current events and incredibly well read?) I wanted to know her secret. Me: I just don’t get how people do it. Me: Make dinner, for instance. While watching a child. I need to wait until Dan gets home from work. And then one of us plays with Jacob and the other one makes dinner. How did you do it? With three kids?? MIL: If you don’t think about it so much you can do it. Me: How exactly does that work? MIL: It’s hard to remember now. I probably had one at my feet or on my hip or in the high chair or something. Me: But they were only spaced a few years apart. So, at one point, you had a baby, and a toddler and a preschooler. How . . .? YES, WOMAN: HOW?!? WHAT AM I MISSING HERE? My mother-in-law paused for a moment. Then looked at me carefully. Presumably to make sure I wasn’t joking. Nope. Nope. I really am this clueless. Then she said four words. That. Changed. Everything. MIL: Turn. On. The. TV. Problem is, we’ve all convinced ourselves that allowing a child to watch a little television is no better than sitting them down with a beer and pack of cigs. We know the statistics. 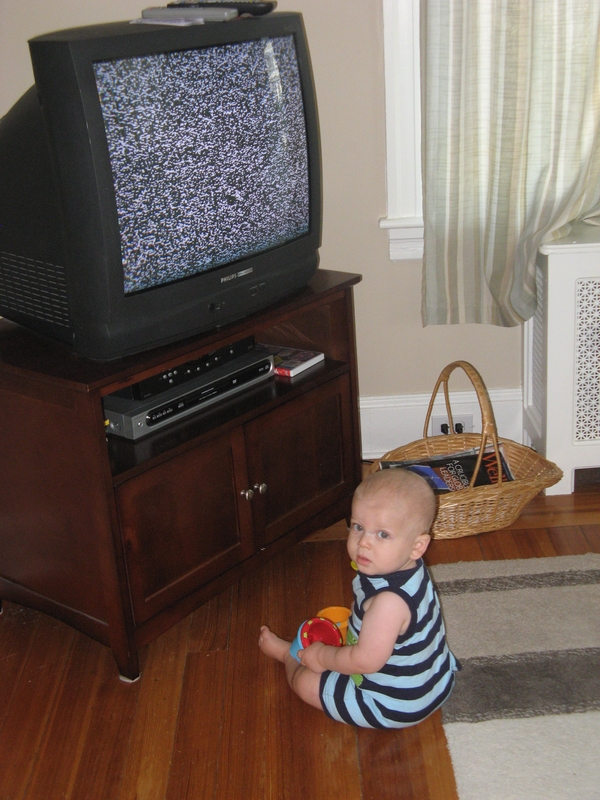 Kids spend far too much time glued to the TV. And the computer. And now also iPads/tablets/whatever. As a result, they don’t get enough exercise. And rates of childhood obesity have skyrocketed. The take home message: TV = bad. Playing with children = good. Fine, fine. But what happens when spending time with your children means that NO ONE GETS TO EAT DINNER?!? Is there a more complex formula in which we don’t have to count the time children spend watching television as ‘screen time’ if a parent is performing a task that is necessary to sustain life . . .? I’m just sayin’. Yeah. I thought so. Because while you were watching reruns of M*A*S*H and Gilligan’s Island someone was BUSY MAKING DINNER. Somehow you survived. Okay, so maybe we’ve gotten a bit uptight about the television thing. What else? Jacob is now just a year away from the beginning of his formal education: kindergarten. The parents of his friends have spent the last several weeks: attending workshops, visiting schools, reading up on charter schools, going to school fairs, talking to parents of students who are already at various schools and getting prescriptions for Xanax. Once again: this is for KINDERGARTEN. What is going to happen when these kids are applying to COLLEGE?!? Meanwhile, Dan and I have managed to remain above the fray. Because we are planning to move. And have no idea which school system to pay attention to. Go ahead and say it: BRILLIANT. Me: No point in registering Jacob here. We’ll probably have moved by next fall. Me: And can’t register him in the new town yet . . . since we don’t know what town that is. Or have proof of residence. Or, y’know, residence. Me: So . . . guess there’s nothing we can do . . .? There’s just one teensy little glitch in this otherwise BRILLIANT (it bears repeating) plan to avoid falling prey to the Mass Kindergarten Panic Attack. If we don’t sell our house this spring, we may have missed some important deadlines. Hmm. Maybe there is a conspiracy to make parenting harder. Or there isn’t. But either way, it seems that parents are a big part of the problem. WHY DON’T WE STOP MAKING THIS JOB MORE DIFFICULT THAN IT HAS TO BE? I guess that’s what happens when you have some information about what may be good for your child. You feel that you have to act on it. Without fail. (Or suffer the guilt of knowing you were responsible for their why-didn’t-you-give-me-karate-lessons-and-make-more-photo-albums-of-me midlife crisis.) Or maybe the problem is that we’re always overthinking things? Nah. Well, it’s possible. On the other hand . . . This entry was posted in Uncategorized and tagged kindergarten, making dinner, television. Bookmark the permalink. I think of education like a melting ice cream: try to get as much of it into the kid’s grasp before it melts, whether or not they end up eating the whole thing anyway. The first licks will be the most important, the rest is up to them. TV schedules? Netflix has 6 seasons of Sesame Street available to stream ‘on demand,’ girl.